Good Cook Doris: Spring has Sprung! One of my favorite things about the coming of spring is the start of farmers market season! Everything is in bloom and us New England local produce lovers can say hello to a new selection (no more carrots!). 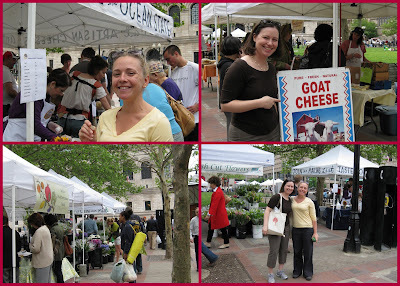 It also means that twice a week my friend Renee and I head down to the Copley Square Farmers Market for lunch. Head over to Local in Season to read my full recap of our first visit this season. There was so much to cover, that I decided to add a post and share some photos here too. We could hardly contain our excitement! For lunch we picked up buffet of goodies: a goat cheese picnic from Crystal Brook Farm, a cilantro falafel wrap from the Herb Lyceum, breadsticks from Iggy's, metch from Seta's Mediterranean Foods, and an almond macaroon from the Danish pastry house! Last year I realized that I did a lot of shopping at Atlas Farms. Almost every week I picked up some green zebra tomatoes, cucumbers, and greens. This year I signed up for a share - put down money at the beginning of the season and charge to your 'tab' throughout the year. It's a great option if you can't commit to a full CSA because you just shop like you would normally (and don't have to remember to bring cash with you). I also picked up two green zebra tomato plants to bring the farmers market home with me. I'm happy to report that my plants are growing big and strong in their suburban location. 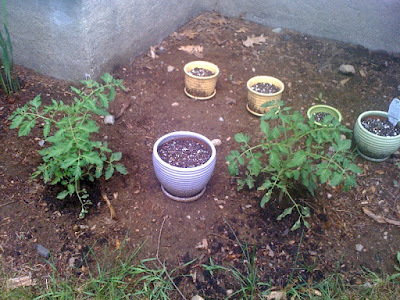 I planted a few pots with lime basil, genovese basil, and chives. Hopefully they will grow just as beautifully as these herbs at the Herb Lyceum booth. I hope to see you at the market on Tuesdays and Fridays from now through Thanksgiving. We'll be there around 12:15 p.m. picking up lunch and new ingredients to take home to the kitchen. Yay, I am so glad the Copley Sq Market is open! I just made goat cheese and pea tendril stuffed pork chops using Crystal Brook Farm goat cheese. SO good!